Belfast Exposed Photography and Ffotogallery are pleased to announce the publication of Becoming, a major new monograph of work by Michelle Sank. The book contains a selection of portrait photographs from projects developed over 5 years. The photographs are accompanied by texts from academic Helen Lucey and the veteran photographer David Goldblatt. 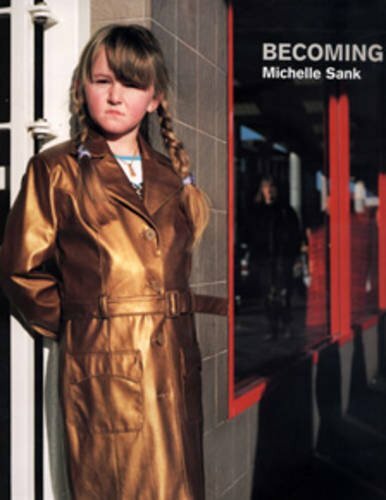 South-African photographer Michelle Sank has photographed young people in different social contexts across the UK. The portraits have been produced through a heady mix of ‘street photography’ and negotiated youth group collaborations. Among others, Michelle has worked with young people living in interface areas of Belfast, young carers- responsible for the care of a sick parent or siblings, teenage mothers and juvenile ex-offenders on a rehabilitation programme. She has worked on residencies in Cardiff, Belfast and Liverpool. Michelle is interested in the experience of growing up, that difficult transition from childhood to adulthood. Her photographs have a strong formal aesthetic but are not staged and the subjects are not directed. Individuals are invited to present themselves to the camera as they deem appropriate. The outcome is a series of portraits that reveal a quiet conflict within its subjects. The young people confidently embrace the opportunity to be photographed with attitude and grace. At the same time they appear vulnerable and doubtful, questioning the complex process and changing realities of becoming an adult. Michelle is interested in the way that individuals are shaped by social structures, how gender, sexuality, class, ethnicity ‘enter into’ us as subjects. The work looks particularly at individuals positioned within lower socio-economic contexts where, for example the promise of adult sexuality appears to offer future security and happiness. Her deceptively simple portraits ask important and probing questions about the status, perception and representation of young people in contemporary society.